International reference pricing (IRP) is a common methodology adopted by developed markets to control drug prices; its use has also been spreading to emerging markets, including leading Latin American countries Brazil and Colombia. As part of the 2017 edition of our International Reference Pricing Guidebook, we take a look at how the formal use of IRP has been evolving in Brazil, as a pioneer of this policy tool in Latin America, compared to one of the region’s latest adopters, Colombia. In Brazil, despite ongoing discussion over modernisation of the Pharmaceutical Price Regulation Chamber (CMED) Resolution 2 of March 2004, this regulation remains the overarching policy defining IRP as one of the tools used in setting a new drug price cap at launch. However, salient changes since 2014 include extending IRP to the pricing of biosimilars as a result of Communiqué 9 of August 2016. Similarly to Resolution 2’s Category I for new on-patent drugs, under Communiqué 9, IRP is used to grant a premium to biosimilars demonstrating therapeutic gain. Otherwise, the price cap of a biosimilar, similarly to Category II (for a new innovative drug without proven superiority over best treatment) and Category V (for a new pharmaceutical form), is determined based on the cost of treatment (with drugs with a similar molecule) and is not allowed to be priced above the lowest ex-manufacturer price under IRP (see Table 1). CMED is evaluating a methodology that recognises incremental innovations as a Category I classification, as the associated IRP premium continues to be used sparingly only for radical innovations. There is also an eagerness to reduce the number of Omitted Case drugs, a status attributed to those that do not fit into existing categories, but for which IRP could also feature in the pricing methodology. 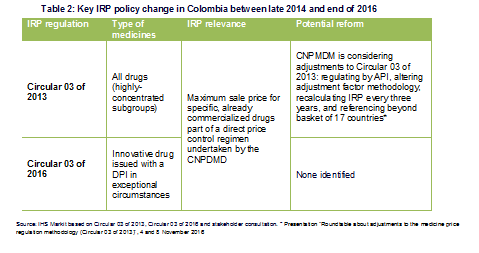 In Colombia, although the National Price Commission of Medicines and Medical Devices (CNPMDM) is debating policy adjustments to Circular 03 of May 2013, this regulation continues to drive use of IRP to determine the price cap of existing drugs with high budget impact in the public sector. As part of a roundtable discussion, the CNPMDM has proposed changes to the formation of subgroups and altering the adjustment factor used for each reference country to convert to ex-factory price instead of the current wholesaler price. Other potential changes pertain to expanding the reference basket due to limited pricing information and the periodicity of IRP-related price revisions (see Table 2). More radical potential reform concerns Article 72 of the National Development Plan (NDP) proposals, under which IRP could be used to determine the price for certain drugs with anticipated high budget impact at launch, after the HTA agency IETS evaluates therapeutic value. Under proposals that foresee significant change in institutional coordination, the drugs for assessment would be chosen by the Ministry of Health (MoH) and the drug regulator, INVIMA. The most notable modification since 2014 is IRP expansion to drugs with a declaration of public interest (DPI), under Circular 03 of 2016. It came following controversy over the pricing of cancer drug Gleevec (imatinib), which was issued with a DPI. This Circular uses a slightly different IRP calculation than the one in Circular 03 of 2013. These Latin American governments have expanded their use of IRP since our last Guidebook edition. 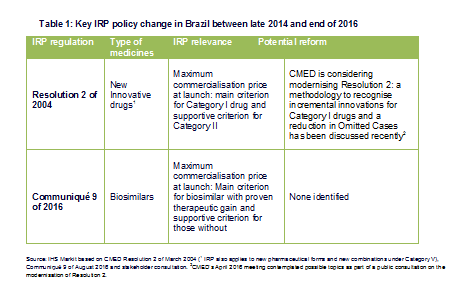 In Brazil, CMED continues to utilise IRP for granting of pricing premiums, judging by the latest methodology adopted for biosimilars. However, IRP is likely to be used sparingly, considering the limited classification of drugs as Category I, something which remains a bone of contention surrounding Resolution 2, due to be modernised following an eventual public consultation. Colombia continues to focus attention on using IRP for highly concentrated subgroups of drugs at a different stage of the commercialisation lifecycle compared to the medicines targeted for IRP in Brazil. The controversial approval of Circular 03 of 2016 shows the Colombian MoH’s versatility in using IRP, with a stricter methodology for a DPI drug. Despite the Colombian MoH acknowledging its limitations, IRP also features amid valued-based pricing and direct negotiations for certain innovative drugs at launch under the far-reaching Article 72 proposals.Overall, these findings suggest that IRP is becoming entrenched as an established policy tool in these leading emerging markets in Latin America. Learn more about our new multi-client study (and download an extract), the International Reference Pricing Guidebook, 2017 Edition. Tania Rodrigues is a life sciences consultant for IHS Markit specializing in healthcare policy, market access, pricing and reimbursement and corporate strategies.